Matt Smith Racing will have two bikes supporting Doug Herbert’s B.R.A.K.E.S. organization this weekend at the NHRA Mello Yello event at zMax Dragway in Charlotte, NC. 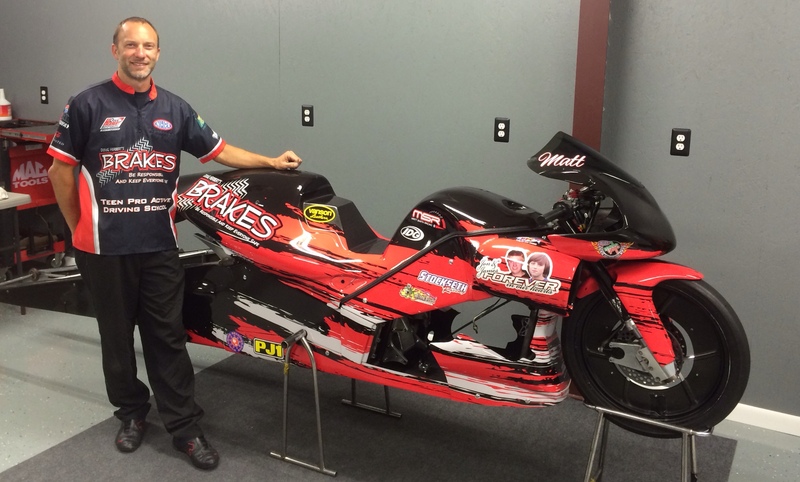 Matt will be riding his championship winning Buell in the B.R.A.K.E.S colors this weekend along with John Hall who has carried the B.R.A.K.E.S. colors most of the season. 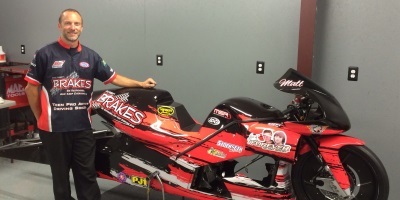 Matt Smith Racing will have two bikes supporting Doug Herbert’s B.R.A.K.E.S. organization this weekend at the NHRA Mello Yello event at zMax Dragway in Charlotte, NC. “I enrolled my son Tristan in the B.R.A.K.E.S. class at zMax right before Indy, the same class that John’s son John Jr. and daughter Mika attended. It was a great class that the kids enjoyed and they all learned something. It’s not a driving class but teaches defensive driving to kids and what to expect in certain situations,” stated Matt Smith. “I have been friends with Doug for a long time and try to help support the program when I can. Since I didn’t have a sponsor for the Charlotte race I talked to Doug about running the B.R.A.K.E.S. logos on my PSM to raise the awareness for the B.R.A.K.E.S. program. John has been supporting the program most of the year and with this being the first race in the NHRA Mello Yello Countdown to the Championship we thought this would get Doug and B.R.A.K.E.S some great exposure,” added Smith. “We really appreciate what Matt and John are doing to help us bring awareness to the B.R.A.K.E.S. program. The best part is that they both brought their kids down to take the class and they went home with some knowledge that hopefully they never have to use but it is there if they do,” said Doug Herbert. Also stop by the B.R.A.K.E.S. pancake breakfast at zMax Dragway on Saturday Morning from 8:00am -10:00am in the DSR Hospitality Tent. All proceeds go to the B.R.A.K.E.S. Origination and all 4 MSR riders will be there to chat and sign autographs. For more information on MSR or sponsorship opportunities contact: Colbert Seagraves at cseagraves@triad.rr.com or (336) 764-2898.